A cover, particularly one that enfolds or encloses. 1. A covering, esp. one that is wound tightly around an object, as an elastic wrap or a compression wrap. 2. To wind a covering around an object. 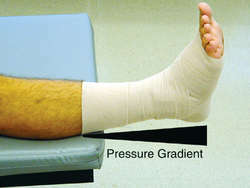 An elastic bandage used to prevent or reduce the formation of edema. The wrap is applied starting distally; it uses overlapping spirals to progress proximally. Greater pressure is applied distally than proximally, creating a compression gradient that encourages venous and lymphatic return. n sheets or blankets, wet or dry, used to wrap the body as part of hydrotherapeutic treatment. See also hydrotherapy. Although he also rips off the wraps, Benjamin Kibias saves them unless "they jail-break", he says. Short-row 4 Purl to wrapped st, purl wrap tog with wrapped st, p1, wrap next st, turn. But punters are commonly choosing tortilla wraps over breaded sandwich options in the belief they are healthier. Supplies listed are enough to make one reversible head wrap. Fabrication processes, such as lamination, plating and planarization, have an effect on the consistency of copper wrap plating thickness across a PCB panel. All Greggs sandwiches are made freshly every day using bread baked by trained bakers so you can be sure that every sandwich, wrap or baguette will taste delicious - and be ready when you are. The Sweet Chilli Chicken Wrap is the latest addition to Greggs' range of freshly prepared sandwiches, baguettes and wraps which already includes the recently launched Coronation Chicken Xtra Bite and the new Chicken Pesto baguette. The other wrap is basically more traditional breakfast fare that is given the semblance of healthiness by being wrapped in a whole-wheat tortilla. ON THE DASHBOARD> BREAKFAST WITH YOUR NONFAT DECAF LATTE? Delworth advises retailers not to assign staff to gift wrap and run the cash register simultaneously. In the last 12 months, market penetration of tortilla wraps has risen from 26% to 31% [TNS Superpanel 52 w/e 31 December, 2006] driven by the launch of the Mission Deli Wraps range. A677), makes reference to both plastic wrap and Saran Wrap.